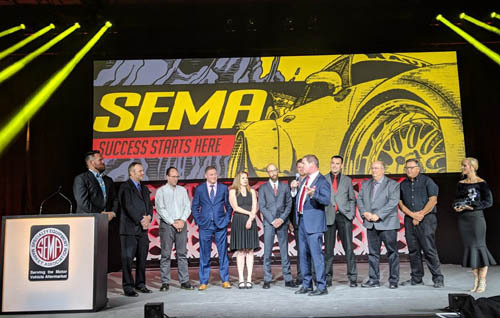 Aeromotive, a market leader in high performance fuel systems, was honored last week at the 2018 SEMA Show Industry Awards Banquet when the company was announced as the 2018 SEMA Show Manufacturer of the Year. With over 2,900 SEMA manufacturers able to compete, three candidates made the slate for the final candidacy prior to the show: Aeromotive Inc., Edlebrock Inc. and Hunter Engineering Company. The award honors individuals and companies that have made a significant impact on the specialty-equipment market during the past 12 months of SEMA's fiscal year July 1, 2017 through June 30, 2018. SEMA's criteria is far ranging and includes history of SEMA involvement, proven outstanding business practices, workforce excellence and employee well-being, protection of brand equity, quality retail displays and packaging, and innovative processes and products. Steve Matusek, Aeromotive's founder and president, accepted the award on behalf of the company. The award was presented by Formula D announcer Jarod DeAnda, and off-road racer and industry personality Jessi Combs. Matusek shared, "This is an incredible honor for our company. I was thrilled to accept the award on behalf of every single employee that works hard to design and build the absolute finest fuel systems and components on the market. We consider ourselves industry innovators who work hard to find solutions to problems. Our commitment to develop the pinnacle of performance products comes from our history, our real world experiences and our passion."